Knebworth Park had only themselves to blame for suffering an 80-run defeat against Stevenage although they took sufficient points to stay above their local rivals in the Division One table. Gary Brown survived two dropped catches and a close run-out call to crack a fine century that put Stevenage in a strong position but, once he was out, the run rate subsided, showing just what might have been if The Park had taken their chances. Brown, along with fellow opening bat Dave Carr (59), set Stevenage off to a steady reasonable start, scoring at around four an over for the first eight overs. On what looked like a flat wicket and a quick outfield, Knebworth knew they were going to have to work hard and take their chances if they were going to restrict Stevenage to a gettable total. Both batters continued to keep the scoreboard ticking over but some ill-disciplined bowling let them off the hook and Brown in particular began to free up. They began scoring at a rate of more than eight an over for 15 overs. A dropped catch at cover off the bowling of Warman to remove Brown when he was on 65 proved costly. At drinks, Stevenage were on 138-0, Knebworth knew if they carried on the way they were going they would be chasing well in excess of 300. After drinks, the breakthrough came when Sam McCrow had Carr caught at mid-wicket through a fine diving effort by Guy Warman. Knebworth then managed to put the brakes on, with Warman and Mo Ali bowling in tandem they managed to slow the run rate and apply some pressure. Brown continued to bat on and reached his 100 in the 40th over before Ali bowled him for 111..
Knebworth managed to restrict Stevenage through the last eight overs before the last two overs went for 24, leaving Stevenage with a very competitive score of 279-5. The pick of the bowlers being Guy Warman’s 2-57 off 10 and McCrow’s 1-39 off 10. Knebworth started off well with the opening pair of Josh Roseberry, pictured, and Mo Asif taking the total to 58 off the 13th over before Asif was caught on boundary. Roseberry and Sergeant continued to grind away at the total before the Sergeant was caught behind for 21. Tariq Umair was then harshly run out at the non-striker’s end backing up after a firmly struck straight drive from Roseberry was dropped onto the stumps leaving Umair out of his ground. Roseberry continued to bat on and struck some superb shots before he departed for a well made 75 before being stumped off the bowling of Scott Davies by Carr. At 140-4 in the 34th over Knebworth were struggling to keep up with the rate. Some hard graft from Ryan Skeggs before he was caught for 16 made the task even harder. Matt Hutchinson was keeping the score moving and when he was joined by Charlie Randall the pair found the boundaries on regular occasions but knew they had to go at nearly ten an over for the last ten overs. Randall fell to a catch at point for a swift 27 and, in the same over, Hutchinson fell for 18 and with that a chance of winning diminished. With the final few wickets being lost for five runs, leaving Knebworth on 197 in the 42nd over, short by another 82 runs. Next week Old Albanians travel to The Park, where Knebworth will be looking to bounce back and continue their decent home form. The second team’s winning run came to an abrupt as lowly Old Haberdashers piled up a healthy target on a superb batting track at Knebworth. Then, the early batsmen failed to provide a firm foundation with a flurry of wickets that saw them slide to 71 for 5 and it was only thanks to new player Mason Tewkesbury (65), Jono Evetts (25) and and Ollie O’Brien (36) that lifted them to a creditable 179 all out, to lose by 61 runs. Earlier O’Brien had got The Park off to an encouraging start by removing both openers cheaply and Graham Fisher with another mean spell of 2 for 17 had the visitors struggling at 105 for 5. But a magnificent sixth-wicket stand of 118 by Lewis Jenkins, who finished unbeaten on 100, and Ben Kohler (68) punished The Park’s support bowling before O’Brien returned to the attack at the end to claim two late wickets as the visitors posted what was possibly a below-par score in the conditions of 239 for 7. It was a disappointing day for the Thirds as a promising start quickly fell away as they lost out to Berkhamsted II. After losing the toss and being asked to bat, Danny Digweed and Ian Pickering (20) battled through against the accurate bowling of the Berkhamsted attack to put the Park in a promising position of 67-2 at the halfway stage. With a solid platform built and wickets in hand, Park began to think about a post 200 target however 67-2 quickly became 71-6 as a collapse saw four wickets, including Digweed (42), fall after the drinks break to leave Park in trouble. Pete Bayford (29) and Ben Childs (15) brought some solidity to the innings and along with Jack Randall (10) helped the Park scramble to a well-below-par 131 before being dismissed in the final over. 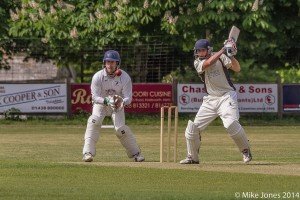 The disappointment then continued in the field as Park were unable to make any significant inroads into the Berkhamsted response as they cruised to their total in just 27 overs. Childs (1-19) and Pickering (1-35) the only bowlers to have any kind of success. An excellent spell of bowling by skipper Jonathan Cirkel in taking a career-best 6 for 46 could not stop the fourth team losing to St Margaretsbury III. His final wicket was thanks to a catch behind, taken by his daughter Catherine. An opening stand of 132 punished anything wide of the stumps from the Knebworth bowlers who were not helped by a number of dropped catches and near-misses. The breakthrough eventually came when Cirkel removed opener Dave Brown for 33 with a catch by David Mantle and followed up with a second thanks to a well-taken catch at cover by Richard Wheeler. That, however, heralded, the arrival at the crease of a Sam Whyman who whacked a quick 47. At the other end, while Cirkel was bowling, opener Mick Anstead collapsed in screaming pain thinking he had torn cruciate ligaments but, after a rather miraculous recovery and cancellation of ambulance request, he left the field just limping badly. He retired on 84. Amelia Kemp was richly rewarded with her first wicket for Knebworth IV with a superb delivery clean bowling the number six.. Richard Wheeler with 1 for 32 and Mantle with 0 for 32 were the most economical of the bowlers. Apart from Phil Wheeler (23) and Jonathan Cirkel (12) none of the early batsmen reached double figures but what was really encouraging was that Kemp (13) and Catherine Cirkel (14) batted well at the end to lift the score to 100 all out. Although the Fourths are still struggling for wins and need to dominate more in the batting, the side continues to have a really good atmosphere and team spirit.